I have thought a lot about the benefits I have derived from a life of running and weight training and it all boils down to being “the athlete” for life. 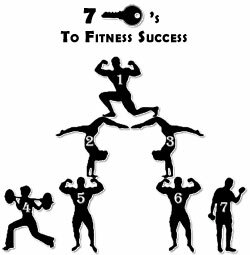 The seven keys to fitness are a result of my efforts over the years to retain and maintain my physical and mental abilities as the years have passed. I have decided that one of my presentations in the future will center on this information and inform audiences that they too can receive the benefits of a life that is full, healthy and fit! My hope is that as you plan for your fitness future you will consider these keys as a way of setting your fitness goals so that you can see the results of a life well lived. Strength is the foundation upon which all the other keys are built. It implies a body – and mind – able to handle varied loads and stresses – capable of withstanding the many challenges life can bring us. I am convinced that after years of debate with myself over the value of value of cardio versus strength training that strength is indeed “the paycheck” and that cardio is indeed the “bonus” just as a former coach argued with me years ago. Strength can be attained in any number of ways – the most traditional means today of course being resistance training. Are you training for strength today? If not, you are losing strength by losing lean mass. The percentages are against us as we age – so get going! Do AT LEAST three days of strength training per week and see what happens to your body! Endurance is the ability of the body – and mind – to train over time and implies a strong heart and cardiovascular system (and mental strength as well). Moving is natural to the body so let’s get moving! Walking, running, swimming, cycling, hiking and any number of activities strengthen the cardiovascular system and the result is a heart capable of pumping many times the volume of blood and oxygen to the cells of our bodies over time. The many benefits of cardio are endless but the one I like the most is that cardio training creates more capillaries in our system so that we receive more oxygen and nutrients for our cells helping them thrive! This is the way to stay young in my book! Power can be achieved by simply living well. I believe in the power of the human mind and spirit so through practice we can increase our power exponentially by focusing our attention on our mental and physical powers through meditation and prayer, yoga, tai chi, martial arts and many other forms of training that will encourage and support us in our development as “whole human beings”. This year I will be attending yoga classes at my gym in order to work on developing my mental and physical power. It is an investment well worth making and who knows where such training may lead us? I know it will enhance my ability to balance life’s challenges and that will be well worth it to me. How about you? Quickness implies being able to respond to whatever life may have in store for us. Quickness of mind, body and spirit leave us as we age “in the traditional model” of today, but why does it have to leave us at all if we train properly? I am working on quickness through my running and stretching exercise programs – and of course will be in my yoga classes as well. “Clarity of thought” is a function of how we are using our minds each day and being tethered to our electronic “devices” is NO WAY to develop our minds – that is “mindless” behavior – in my opinion of course. “Thought” is where ALL human experience originates so be “quick” to recognize how you are using your mind each day and “respond” – don’t react to life’s “curveballs”! John Wooden used to tell his players to be “be quick, but don’t hurry”. Isn’t that great advice for all of us? Speed is a function of how well we are treating our minds and bodies as we age. I have developed speed physically as I have aged through my running program but there is also “speed of thought” as well. My mind is able to process information relatively quickly because I try to keep it “uncluttered” at all times and my body responds positively as well because it is healthy and able to “roll with the punches”. Drugs and illnesses sap our ability to be fast physically but our minds are resilient so let’s make an effort to be “conscious” of the role being fast may play in our lives. 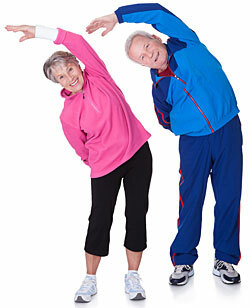 Older people are not fast and many people “wish” they had known early in life the value being of being fast. Joint replacement surgery and other debilitating surgeries that typically come with age to repair life’s damage we caused unconsciously must be avoided if we are to remain physically prepared for the years ahead! Balance is a goal I am setting for this year by taking yoga classes and meditating more – not less. Balance implies being able to withstand – and stand up – to the many unknown events and circumstances that WILL surface throughout the years. Being balanced to me means having a joy for the work one does, an abiding passion for life, friends and family who love us and care about us, money in the bank, time to play and have fun, time to travel and see the world we often can only imagine, time for personal growth and discovery – and so much more! How many of us live life like that – even a little of the time? I suspect time is our greatest ally – and enemy – we never have enough right? So make the time for yourself and see what happens. You may be surprised at how happy you truly can be! The final key really speaks for itself, doesn’t it? If we are flexible mentally, physically, emotionally, and spiritually, how healthy could we really become? I would say the answer is that it is unlimited – like the human mind in all its potential. Being flexible implies being adaptable and willing to change and this is the challenge we all need to face each day as life unfolds in so many unknown ways before us. Being flexible means being accepting and forgiving and this in my estimation is the key to long term happiness. “I am flexible, adaptable, open, receptive, willing, forgiving and grateful” is something I put into my conscious mind in the morning and for my subconscious mind before I go to sleep at night. It is worth every ounce of thought to remember this every day and work toward “living” it as well. Strength, power, speed, quickness, endurance, balance and flexibility are the seven keys to being fit mentally, physically, emotionally, and spiritually. Practice using them every day and you will eventually “embody” them – they will BE you and you will BE them. Each year that I live I evaluate areas in which I may grow and develop further – both as a person and as a professional. Work these keys into your life and you will be surprised at how your life unfolds in health and well being. It is an effort that will pay dividends far into your future and bring you joy and contentment – and finally peace.